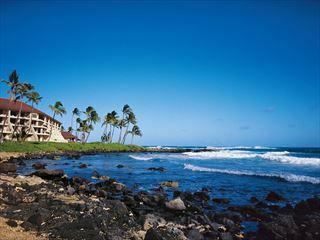 An extraordinary experience awaits you at Grand Hyatt Kauai Resort & Spa. Impeccable service and lavish amenities greet you at every turn in this Kauai luxury hotel. Relax in elegantly designed guestrooms offering stunning views from a private balcony. Enjoy the 50 acres of lush gardens and landscaped swimming pools, set on the ocean front. Play 18 holes on the Robert Trent Jones Jr golf course or relax and refresh in the Anara Spa. Close by to Poipu, this luxury retreat provides a sensational beachside location synonymous with the typical Hawaiian lifestyle. Upgrade to a Pool or Ocean View room, Ocean or Deluxe Suite. Hale Nalu - A vibrant venue offering fresh poolside drinks and light fare. Captain's Bar - Enjoy a fruity cocktail whilst overlooking the lagoon. Shipwreck Bar - Nestled by the active pool near the waterslide, this is a fun bar with a great selection of alcoholic and non-alcoholic drinks. Seaview Terrace - A welcoming restaurant serving breakfast, salads, pizzas and burgers - a family friendly venue with nightly Hawaiian entertainment. Ancient healing remedies and state-of-the-art facilities create an unforgettable spa experience.